Ballers has just rounded the halfway point for season two this week, and it decided to save its most bipolar episode for just this occasion. In the process of pulling at all of the various plot threads that the show currently has going on, we got some of our most sincere character drama mixed with the most out of place silliness that the show has delivered to date. So what did Most Guys have in store for us? Let's dig in, shall we? This episode of the hit HBO series starts off with Spencer (Dwayne Johnson) finally getting his hip looked at, and he can no longer hide behind pain pills and denial. His doctor informs him that he is in need of a hip replacement, because he has osteoarthritis. I'm no doctor, but her description makes it sound quite awful, and quite painful. Spencer heads into immediate denial mode and just wants more pain pills. She refused to oblige, so Spencer winds up visiting some shady doctor in a bad part of town to get a prescription to get him by. No doubt, this is heading to a bad place, and it is one of the most interesting plots the show has going for it. But instead, this episode decided to get a bit silly. To get his mind off of things, Spencer decided to go to the office and yell at Joe (Rob Corddry) in order to get their registration approved for the firm, and to tell Jason (Troy Garity) that he wants to try and mentor Travis, otherwise known as the D bag who skipped the combine and left Jason in the swamp last week. This is not a good idea, as the NFL frowns upon agents meeting with unsigned players. But hey, Spencer needs to do something to get his mind off of the fact that his body is totally broken. Speaking of broken, Vernon's (Donovan W. Carter) foot is still very broken, and he has just been sitting on the couch letting Twitter haters get to him. Not exactly a great idea. Reggie (London Brown) gets the bright idea to get Vernon an exotic animal of sorts to cheer him up, and enlists the help of Joe to do so. This is where the episode goes annoyingly off the rails in a silly way. 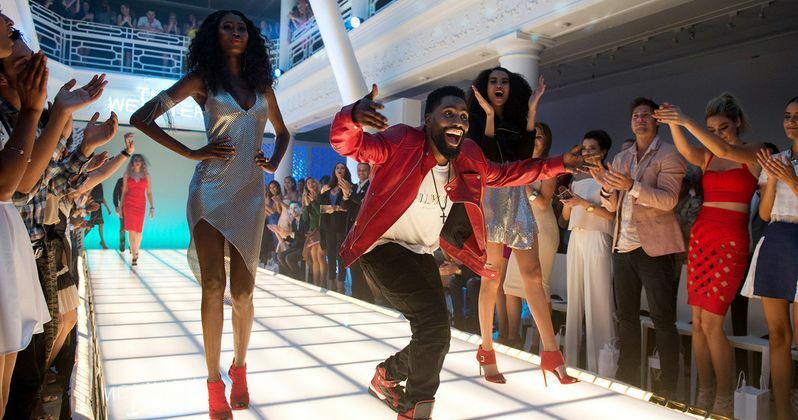 The pair head to an exotic animal dealer, who Joe knows through Ricky (John David Washington). You know, because we've gotta keep these people connected somehow, right? Anyway, they wind up buying a Llama, which blows a lot of snot all over Reggie, and the two lose it in the yard and have to chase it down. The only thing missing was the Benny Hill music. Seriously, why? There are better things going on. Meanwhile, everyone's favorite totally disconnected character Charles (Omar Benson Miller) actually met up with the gang for once at a fancy fashion show that Ricky so happened to be at. Ricky is also mowing over taking a $33 million offer from the Buffalo Bills. Ricky convinces Charles to go tell off the Dolphins for cutting him, but then immediately runs into his ex-girlfriend from last season. Drama to the max. Feelings and emotions and such. Whilst Ricky chats with his former lady friend and realizes he doesn't want to go to Buffalo, Charles pays his visit to the Dolphins, and winds up getting offered a job in the front office. Good for you, Charles! Oh, also, he finally got a bit of revenge on that lame kid with the Subaru who has been speeding through his neighborhood. So yeah, Charles came out on top in a big way this episode. So that was nice. Later on, Spencer does actually meet up with Travis in order to work out and teach the kid a little sorely needed humility. This totally works out and is kind of a very satisfying moment for Spencer who otherwise has had a pretty rough go of it in this episode. However, his trouble isn't over. When he meets up with Joe at the office, someone is there to see him, and it isn't good. A man from the union pays Spencer a visit to dig into his financial situation, which we find out is pretty grim. It appears that his property deal with Andre (Andy Garcia) was much worse than any of us expected, and that is where we leave off, which is pretty bleak and very sad for Spencer. Oh, also, Joe and Spencer got their registration approved. Another kind of needless thread in the episode, especially since it got resolved so easily. In any case, if we can abandon some of the needless silliness, there is some heavy stuff coming in the next few weeks, and we can only hope that The Rock can keep from going down a pretty dark path. Can we all just agree that we love Charles and are very happy for him? We'll have to see if Spencer has any of those pain pills left when Ballers returns next Sunday on HBO at 10 p.m. EST.